The Consumer Electronics Show (CES) in Las Vegas can be a window on where we are heading with brave new formats. New 21:9 UHD widescreen 105″ TVs will be shown Jan 7 -10 by Samsung and LG. Do the math. Yikes, that’s 2.33:1. Not 2.39:1 or 2.35:1. Or maybe it’s 2.37:1, if you count pixels. 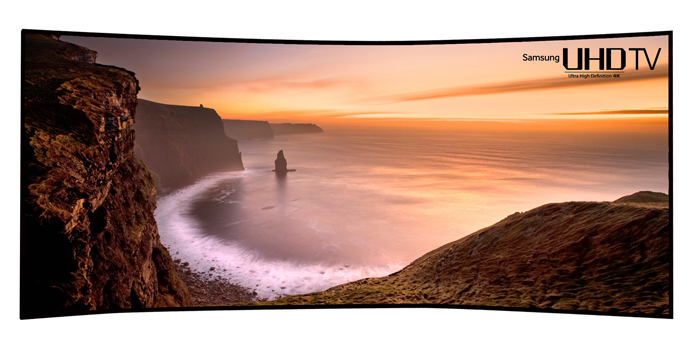 The 105-inch curved Samsung and LG TVs have 11 million pixels (5120 x 2160). The winners could be the makers and renters of the new wave of anamorphic 2x lenses and high performance spherical lenses with excellent performance all the way to those wide screen edges. And how will content be delivered? Overnight downloadable on demand, slightly faster than Fedex next day Air. But I vote for SD cards. An 8 GB card costs around $6 and doesn’t need any moving parts like a DVD or Blu-ray player. How exactly are you doing the math for the aspect ratio? James: Here are my calculations. Samsung calls it a 21:9 TV. So 21÷9=2.33. If we calculate with the pixels, 5120÷2160=2.37.